The 2011 Mustang is on the road and Ford has been busy spreading the word about this incredible new Mustang. As has been typical with pony car styling for decades, Ford comes out with a new model every 5 or so years, which is not to say an all new model, just a major restyling. So, since the beautiful 2005 model showed up, styling changes have been evolutionary, not revolutionary. In this department, the 2011 Mustang doesn't try to rewrite history. The good news for the coming incarnation, however is the fact that Ford has finally become serious about V6 performance. They weren't serious before? Hmmm... lets see, an 88 horsepower base engine for 10 or so years. Then 105 hp for about the same time. Until the 3.8 liter V6, the non V8 offerings were hard pressed to get you up the incline of your driveway. The 2005 finally gave us a respectable 205 horse power, but clearly, with the too muffled sound, FoMoCo didn't think you'd be interested in even hearing it. So jump to the 2011 Mustang. The engineers at Ford announce that there would be an new all aluminum DOHC (dual overhead cam ) 3.7 liter V6 engine making 305 horsepower and 280 lbs of torque. That means that this V6 performance motor will be putting out more power than the 2005 GT's 300 horse power! Naturally that means that the V8 for 2011 has to be even more powerful, and it is, but that's something we'll talk about in a moment. In the meantime, you know that the aftermarket performance parts manufacturers have been drooling with excitement thinking about all the stuff they can design to make it even faster and more powerful. And it's starting to emerge. BBK and Ford Racing seem to be the first to enter the arena to make some performance improvements. 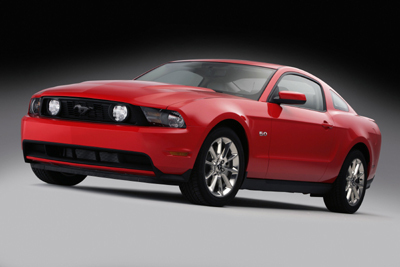 Here's a link to the newest new 2011 Ford Mustang V6 performance modifications and parts. As noted earlier, styling changes for the 2011 Mustang exterior are evolutionary. The front bumper and nose area are slated to receive aerodynamic refinements and a revised and taller rear spoiler. Along those lines, a continuation of the current retro 1970 style headlight and gills combination is expected. Shelby American recently celebrated the 45th Anniversary of the Shelby Gt350 Mustang and the anniversary of the Big Block Shelby Mustang at Barrett-Jackson in Scottsdale Arizona. Follow this link for full Details and pictures of the 2011Shelby GT350 Mustang. Direct from the Detroit Auto Show is news that the 2011 California Special is returning. Ford unveiled a bright red GT C/S featuring a blacked out lower front air dam or valance and some very sharp 10 spoke alloy wheels. Fleet orders for the California Special Package 402A started on January 18, 2010 and I understand that Ford gets to work building the 2011 cars March 15th. 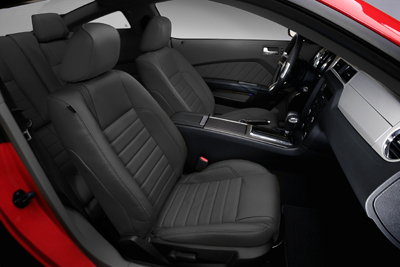 Interior changes for the 2011 pony car are somewhat minimal. The one carried over change that I like the most, is the soft feeling dash. What Ford was thinking when they designed that cheap hard plastic dash in the 2005 car was beyond me. As a matter of fact, the entire interior is much better than the first couple of years following the 2005 model. In my opinion, it was taking a perfectly good design and then using lousy materials to turn it into something that should have only showed up in a Kia rental car. Bottom line? The new interior keeps the classic mustang feel, updates and smooths out a few nooks and crannies and keeps it ahead of the Chevy and Chrysler boys. The new speedometer pegs the needle at 160 mph. 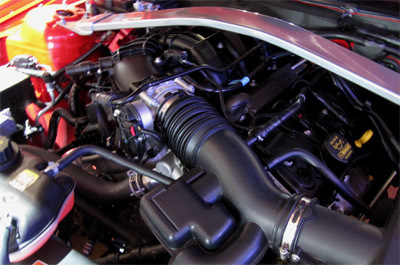 The engine and power train is where the new 2011 Mustang really shines. The big news for the V6 as noted above is the 305 hp all aluminum DOHC engine with a 3.7 liter displacement. With the new Camaro and even the Hyundai V6 engines pumping out real horsepower, Ford had to do something or look like chumps. Time will tell if they were right. The bigger news in the V8 department, and again as a result of 400 plus horsepower offerings from Chrysler and GM have kept the factory performance wars alive at Ford. The 5.0 liter V8 is back, with its 4 valve Dual overhead cam (DOHC) heads. Dubbed the Coyote, this new engine growls out a formidable 412 horsepower with a big block style torque output of 390 pounds. You can find more technical information on the new Coyote engine below. Ford's new take on variable valve timing suggests this performance will go along with a very respectable 25 mpg on the highway. Helping both the economy and performance is a new 6 speed manual transmission. 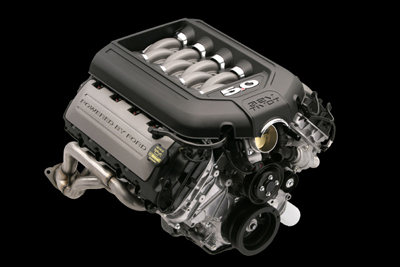 The new, exclusively Mustang Coyote engine is a feat of engineering excellence. more details and specs on the Coyote are here. We have more than just Mustang pictures! We have 2 new 2011 Ford Mustang GT 5.0 V8 videos courtesy of FoMoCo. 2011 Coyote GT 5.0 liter V8 revs up to 7,000 RPM ! The 2011 Daytona Pace car is a Mustang! Check it out. I had the opportunity to get in to see the new 2011 Mustang V6 premium convertible, the 5.0 liter Coyote V8 in a new Mustang convertible and a very nice 2011 GT500 before the crowds. The folks at Ford were great, opening up the cars so I could get lots of new photos of the 2011 cars. 2011 Mustang in Vancouver section. New dyno results show Ford has been making very conservative horsepower claims for the Coyote engine. Also, the new 3.7 liter V6 numbers are looking on the low side. Check out the impressive specs from some of the first new Mustang dyno results. With an already potent new V6 which finally produces a powerful V6 Mustang option, Ford has in store, a factory optional V6 performance package, which brings up the already beefier standard suspension, brakes and drive train to even higher levels. Here's the full details on the 2011 V6 performance package. 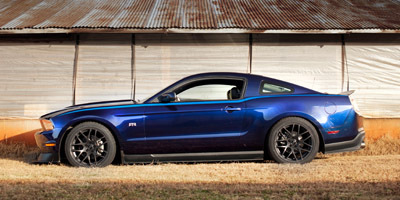 Motor trend recently did a 2011 first drive for the 2011 V6 Mustang. Here's some first hand information and a video showing the new V6 Mustang out on the track. News straight from Ford says sales are booming, and not just for those 5.0 liter V8 cars... More. Sales figures are in for May and the new Mustang is pulling away from the competition. Here's more.. There's a new tuner car in town for 2011 and it's called the RTR. The concept was created by drift car guru Vaughn Gittin Jr.and will be a dealer option. It's quick, looks good, and of course it handle's. There's a new Pony car in your local Ford Dealership you just might want to check out, if you were pining over the custom Ford Mustang created by DUB Magazine for Nelly. Ford just released a new 2011 Dub Edition Mustang. Here are the details. The 2011 Ford Mustang makes another prominent role in the new TV series Hawaii Five-O. Here's the link to the full Hawaii Five-O Mustang information and video. The folks at Powerblock, tested out the new 5.0 liter Coyote engine, to see if that new Ford V8 really was underrated as everyone suspected. Here's the surprising results for the Mustang Coyote engine. You asked for it. Here' s a breakdown on 2011 Prices. 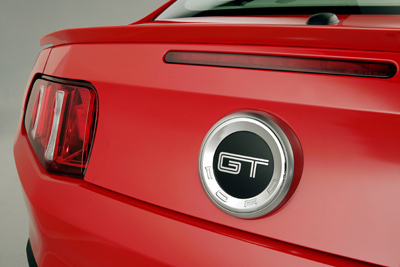 You always knew the 2011 5.0 liter GT was a winner, but now they've proven it! The 2011 Ford Mustang GT just won the Kelly Blue Book's Best Resale Value Award in the high performance category. This honor goes to vehicles which are expected to keep the largest proportion of their original list prices. 2012 Mustang Order Guide just came out, with information on 2012 Mustang prices, options and of course more info on the 2012 Boss 302 and Laguna Seca.